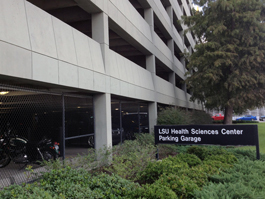 Our mission is to provide well maintained, clean parking facilities and related administrative services for the faculty, students and staff of LSU Health Sciences Center in New Orleans. With a continual focus on customer satisfaction, the parking rates are easily the most reasonable in the metropolitan area. Each parking lot is secured and gated. Dispersed in multiple locations around the Downtown and School of Dentistry campuses, the parking lots are monitored by video cameras.